Will here, with an announcement for our quaint little village here on FPGeeks. 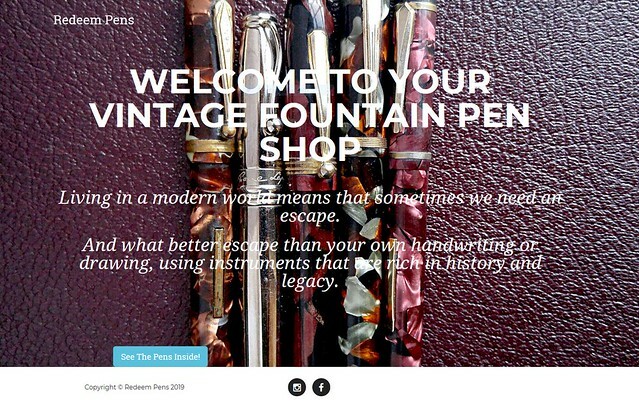 After selling my restored vintage pens and learning a few lessons in the past years, I finally made the decision to launch my own pen shop. This online shop has been in "soft-opening" mode for a 2 months now. And it's time to open it up more (with continuous improvement in mind). At first I thought about making it like other websites where people can do click to buy, but then I thought some more and realized, that is not something I want to do. What I love to do is to talk to people about vintage pens and be involved in their decision making. I find that this is the best way for me to ensure that my buyers are happy, and so far the result shows. I sold hundreds of pens and have two returns because the buyer were unhappy with the pen. So in the end, this pen store is kinda like a throwback to the past where the proprietor chat with their customers, both new or long-time ones. But of course, I accept Paypal and all those digital convenience, and I ship anywhere USPS delivers in the world. Don't worry, I won't start spamming this For Sale area beyond this short announcement, and I will remain active in the forum for the sake of our shared interest, which I enjoy very much. See you in the Redeem Pen shop, and around. A little out of my price range, but clearly a treasure trove for them what can afford it. Goodness, if they are cleaned, sacced and adjusted (as I bet they are), penwash offers some great buys! Yessir! I don't sell unrestored or untested pens. I do what is necessary for a pen, be it cleaning, re-sac, adjusted the nib/feed/section for inkflow, replace lever, j-bar, vacumatic plunger diaphragms, thread sealant, snorkel o-rings, vac filler packing units, safety pen seals (both Waterman and Moore styles), piston corks, even Japanese eye-dropper corks (the ones that will unscrew out of the body), and some odd filling mechanism that defies explanation! Oh no!! I wonder what could be wrong. That site has consistently getting about 20-30 visitors daily for the past month, and a healthy return visits too. Could you try with different browser? - when going to the site, it would be nice if the first pen was already 'selected' so that you view it in the right portion; when I first landed I thought "why is everything skewed left and all that space is on the right" - clicking on a pen showed that is where the 'preview' is. I've looked before and will continue looking now that you're announcing it. One thing, can you add the nib size/type in the table? So many great pens. Wow. Congrats on the site and hope it works out brilliantly. Site looks good on mobile (Android, Chrome) but it wasn't immediately obvious that the pic preview displayed upon selecting a row since the preview is below out of sight. A pop up dialog with next, prev, and close buttons would be a more standard/intuitive approach for mobile users but other options exist if analytics suggest it is necessary. Anyway just throwing that out there if it helps. Thank you for the support, Lloyd! We'll have to see about adding the nib type on the table, because the table (on the left) can't be too wide, otherwise it'll start to overlap with the detail content on the right on some smaller screens. Thank you for the support and a great suggestion on the pop up. The site was designed for desktop, but it'd be foolish for me to not make it friendlier for smaller screens of tablets and phones. This is good news! I’ve had great experiences dealing with Will, and look forward to browsing the new site, in the near future. Great shop, Will! I wish you every success.